This time it's a little trickier to create opposites. We will need to multiply BOTH equations by different numbers to end up with terms that are opposites. You can choose to get the x's or y's to cancel, it doesn't matter. Let's choose the x's to cancel. Right now we have a 2x and a 3x. If we multiply the first equation by 3 and the second equation by -2, we'll get 6x and -6x. It's somewhat like the process of finding a common denominator when you're adding fractions. Sometimes you need to multiply both equations to get terms that will cancel. Once you get terms to cancel, the rest of the problem is pretty straightforward. Solve for each variable. 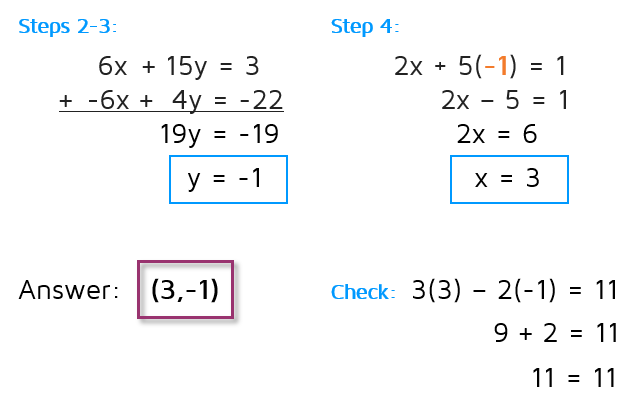 Write answer as an ordered pair and check by plugging the values into an original equation.